This light has a 250 watt bulb for lots of light where you need it without the extra heat you get from a 500 watt light. The light is mounted on a swivel clamp to allow the direction of the light to always be where it is needed. The clamp will fit on a standard floor joist so it will not need to be on the wet ground. This will help protect workers from electrical shock as well as the heat from the light burning the vapor barrier. 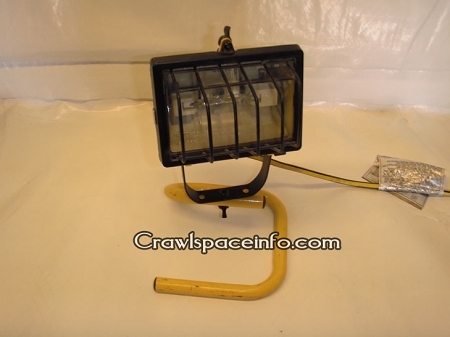 This light can be mounted three ways; with stand, with clamp and with a ground spike. All three mounting methods are included in the package. 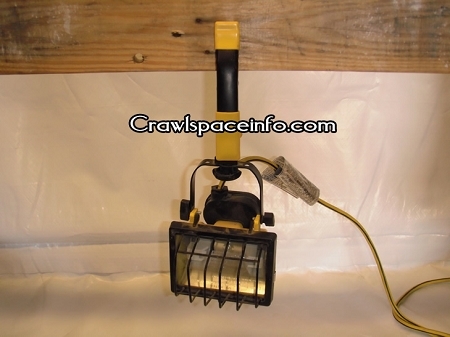 The crawl space light was a great product. It is perfect for my needs. I am most pleased with this purchase.